This month’s issue of LibFOCUS celebrates First Nations, Inuit and Métis people by looking at the roles they play in Canada’s past, present and future. 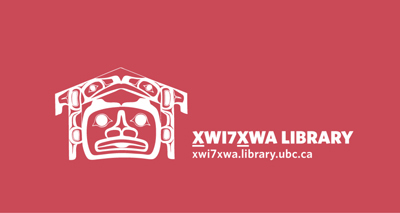 Highlights include a feature on Aboriginal (Un)History Month events, a profile of Xwi7xwa Library, and Aboriginal scholarship resources at UBC. Xwi7xwa (pronounced “whei-wha”) means “echo” in the Squamish language. Guided by Raven, symbol of creativity and learning, the Library strives to echo First Nations and Aboriginal voices and scholarship through its collections, instructional services and programs, and guides. Xwi7xwa Library is the only Aboriginal branch of a university library in Canada. Library collections comprise a vast territory of scholarship, intellectual traditions, cultural histories and memory. The Xwi7xwa Library catalogue maps this territory to reveal the Indigenous content hidden there. It thereby facilitates research, helps students create their own learning paths, and increases Aboriginal awareness for a wider public. Xwi7xwa Library serves the First Nations House of Learning (FNHL) mandate to make the University’s vast resources more accessible to Aboriginal peoples. It identifies and promotes research of benefit to First Nations, Métis and Inuit peoples. By making these resources more accessible, the Library aims to educate the University community and wider community about Aboriginal issues and concerns. Xwi7xwa Library undertakes best practices in the preservation and digitization of unique materials. It develops protocols that respect Aboriginal concerns regarding Indigenous cultural and intellectual property. Aboriginal Research Guides on Aboriginal Studies, Aboriginal Education and Aboriginal Languages. The University of British Columbia Point Grey campus is located on the traditional, ancestral, and unceded territory of the hən̓q̓əmin̓əm̓ speaking Musqueam people. We thank Musqueam for its hospitality and support of our work. UBC Library, in partnership with the Musqueam Indian Band, the Centre for Teaching and Learning Technology and the Museum of Anthropology, has coordinated a series of events in June. Aboriginal (Un)History Month celebrates Aboriginal creativity, scholarship, and intellectual traditions. It aims to educate, and cultivate conversations about relationship, representation, and recognition. The events, which include film screenings, discussions, lectures, exhibits and tours, introduce some of the dimensions of Aboriginal scholarship, and celebrate creative expression and pedagogy at UBC Vancouver and beyond. 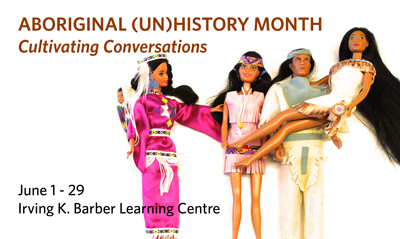 Throughout the month, these events introduce a wide range of Aboriginal experience and examine different meanings of the term “history” through the leadership of Aboriginal youth, research, media and curriculum resources. Historic representations of Aboriginal peoples have contributed to the development of negative stereotypes. Ways of dislodging stereotypes are explored through a spectrum of imagery, objects, and texts from various media, including student films. The month of June is designated as “Aboriginal History Month” by the federal government of Canada. *please note this event was rescheduled from June 5 to June 14. Musqueam Indian Band Aboriginal Day activities, Musqueam Community Recreation Centre, 11 a.m. to 3 p.m.
National Aboriginal Day at Trout Lake, Burnaby, 12 p.m. to 5 p.m.
Coordinators: Aboriginal (Un)History Month was coordinated by UBC Library (Xwi7xwa Library, the Irving K Barber Learning Centre), the Musqueam Indian Band, the Center for Teaching, Learning and Technology, the Museum of Anthropology and the Native Youth Program. After 16 years of negotiations, the BC Treaty Commission asks Harper to step in – article from Globe and Mail. The BC Treaty Commission’s annual report for 2009 is available online. On October 13, 2009, the BC Treaty Commission released the Common Table Report, which captures the 13 days of discussions in 2008 among the governments of Canada and British Columbia and more than 60 First Nations. Included are 21 opportunities the parties agreed to explore further to move treaty negotiations forward.